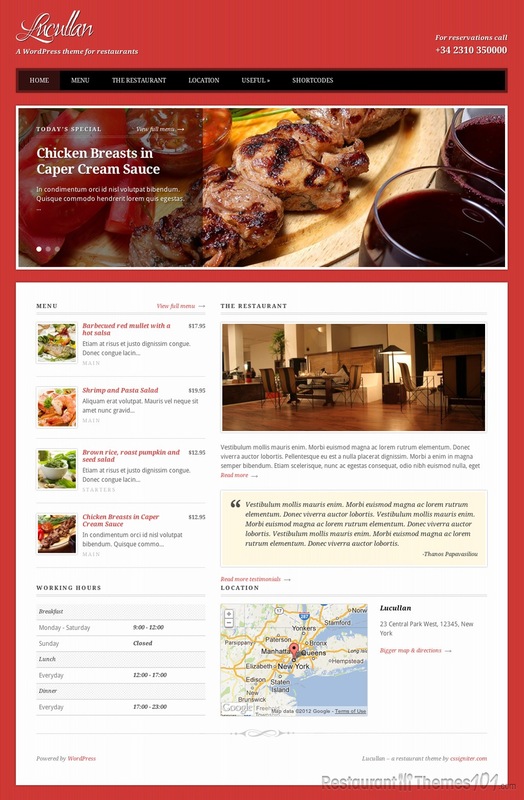 Lucullan is a perfect WordPress theme for almost any type of restaurant. It features a solid-color background, which draws the reader’s attention into the center of the page, where all the important content is listed. Front and center is a large sliding picture gallery, where you can display your best dishes with pride. The pictures slide up, unlike most galleries which feature a sideways slider. You can also have a brief description displayed with each picture, and you can even include a link to the full menu in the description. Lucullan gets right to the point. Under the sliding gallery is the menu, which can be fully customized in a number of ways. 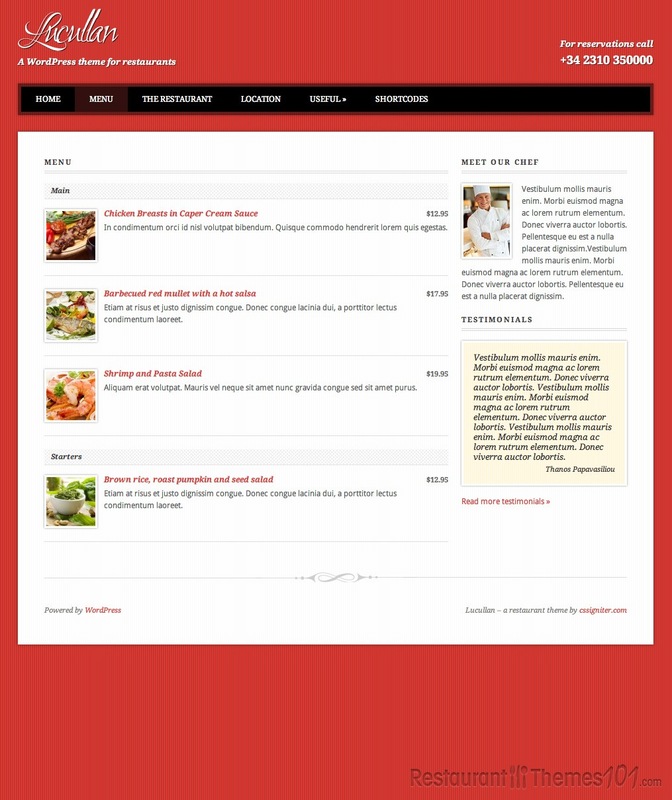 If your menu is long, you can display your featured dishes on the front page, and insert a link to the full menu wherever you please. Under the menu is a list of your daily hours. 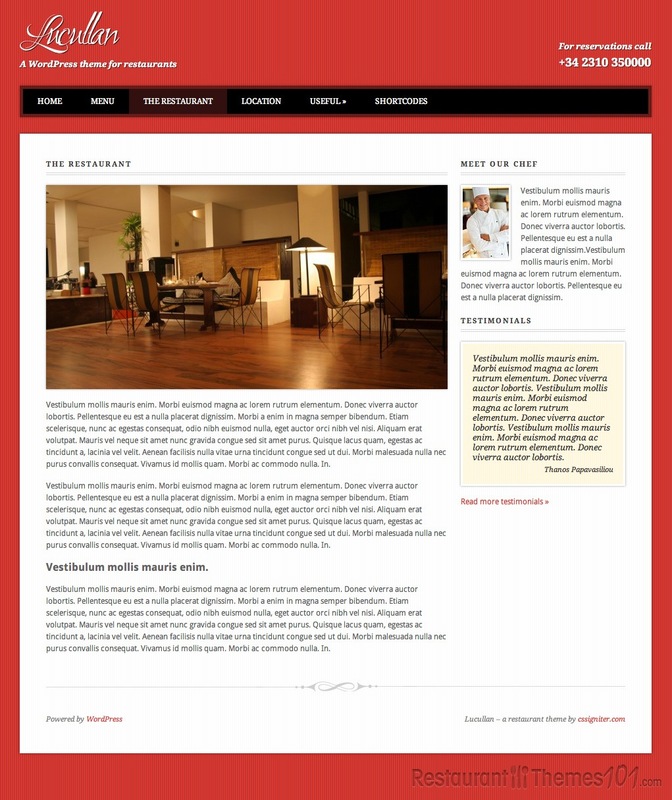 On the right side of the page, you can add pictures of your restaurant, and display information about your location. You can even implement Google Maps to show your exact location on a handy, interactive map. Lastly, if you so wish, you can list testimonials or reviews on your front page. Lucullan, and every other theme from CSSigniter, for that matter, features cross-browser compatibility, meaning that if you use this theme, your website will work no matter what browser it’s viewed through. This may not seem like a big deal, but many competing theme developers simply cannot guarantee cross-browser compatibility. Lucullan also features color variations, custom menus, a handful of theme options, and full support. It may not be the most customizable theme out there, but it has enough options that you can find a combination that you like. This theme is perfect for new webmasters, as it’s very simple and to the point.